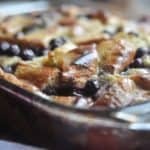 I’ve partnered with Crazy Fresh Produce to share this post. 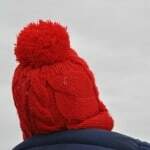 Thank you for supporting the organizations, companies, people, and events that I choose to work with, sponsored content grows my blog and supports my family. No matter the time of year, I always find that giving my kids healthy snacks to be a challenge. 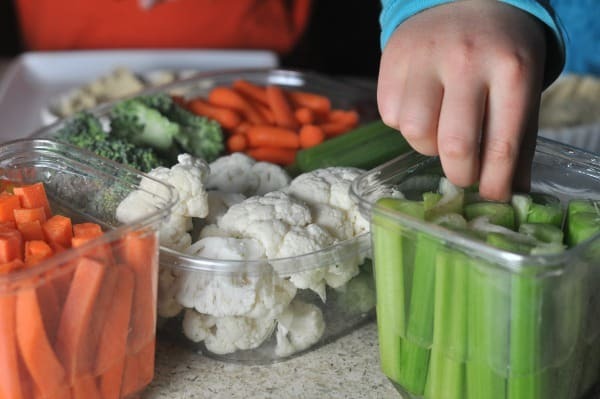 Whether it is during Halloween candy time, holiday cookie time, or even during the summer when my kids are always hungry, making sure they have healthy snack options is always something I’m working on. It takes thoughtfulness on my part to be checking labels, buying nutritious snacks, and making sure they are readily available and within their reach. I also love finding really great products that help me achieve that! Crazy Fresh Produce brings families the widest variety of fresh-cut and specialty items you’ll find in the grocery store. Their goal is to turn the produce aisle into the new snack food aisle by proving that convenience foods can be fresh, wholesome and full of flavor. All of their packages are designed for the grab-and-go lifestyle and are easily stored. Crazy Fresh Produce products are available in the Midwest and they work with local farmers and national grower partners. 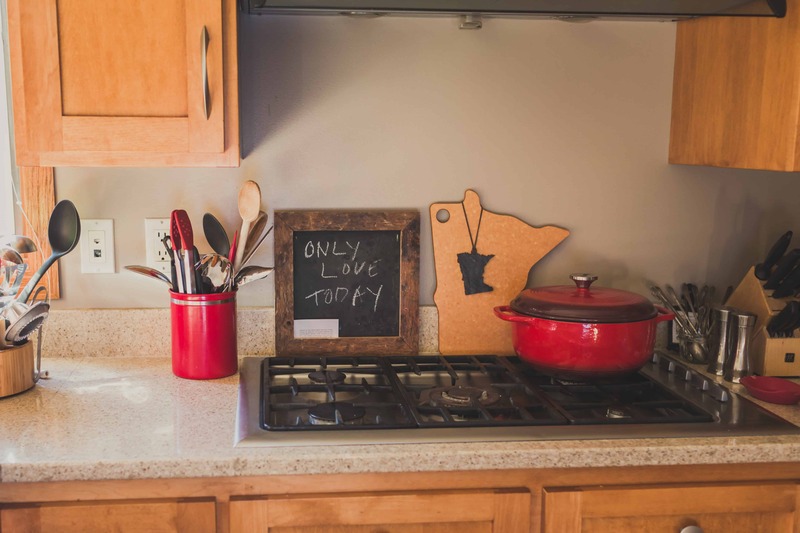 So much of their mission and product resonates with me, I love their connection to the Midwest and to local farms, and I really love that their products are guaranteed fresh and help with giving my kids a healthy grab and go snack. With the help of Crazy Fresh Produce, I’ve been working on offering healthy snacks for my family. 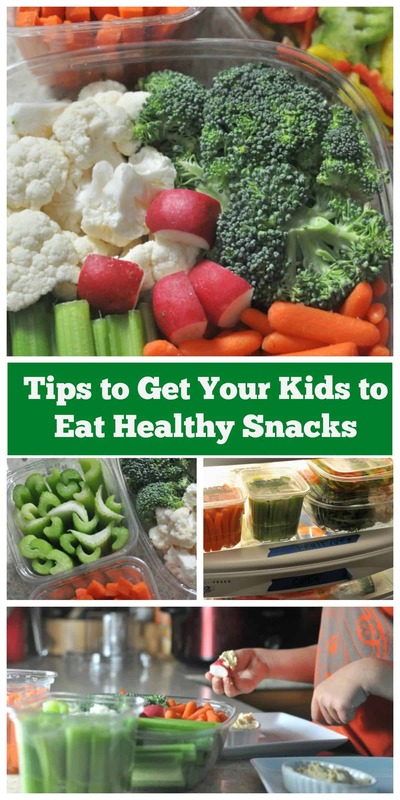 Here are my tips to get your kids to eat healthy snacks. Healthy snacks should be accessible and that means easy to reach and see for kids. In our pantry, I keep everything organized in these plastic dish pans (amazon affiliate link). 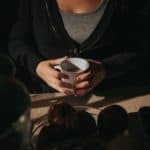 I have one for healthy snacks and inside the bucket, I keep healthy snacks like packaged bars, crackers, or snack packs I make by dividing up a box of snacks and putting the portions into snack-size baggies. In our house, if veggies are stuffed in the back of the fridge, they don’t get eaten and usually end up in the trash. 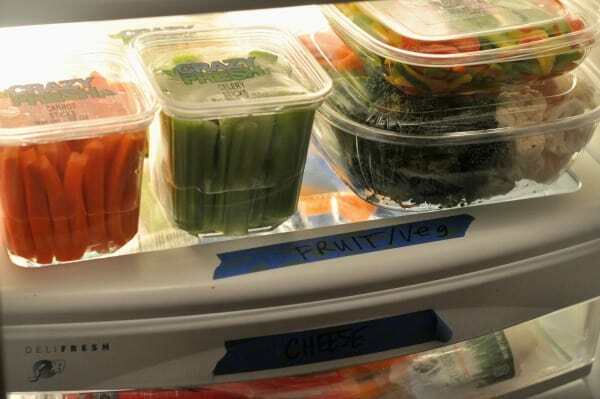 Now I devote one shelf in my fridge to veggies and fruits. It is labeled with painter’s tape and everything on the shelf is easy to grab and go for the kids. I’ve been keeping Crazy Fresh Produce veggies on the shelf and we’ve all loved the convenience and quality of the veggies. Make smoothies or smoothie bowls: this is a fast snack and you can blend up veggies, fruits, and protein-rich foods. 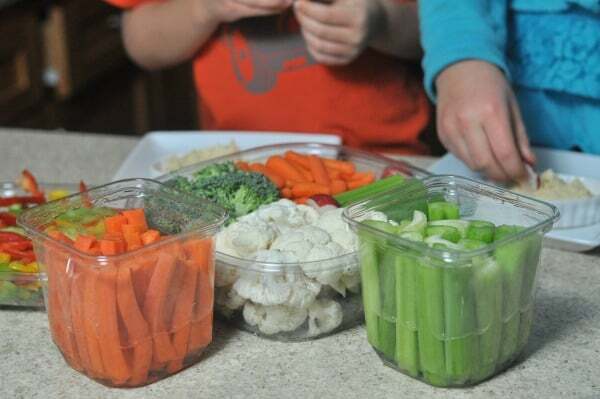 Offer new veggies and allow kids to explore. We were in a rut where I was just serving frozen peas and carrots because it was so easy. Buying a product like Crazy Fresh Produce is totally for me because it is easy and ready to serve and I can offer a variety of foods. I set out the Fresh Veggie Value Bowl recently and found out my son loves radishes and my daughter really likes cauliflower. Who knew?! I like serving vegetable snacks with cheese sticks which is a protein-rich food that helps keep your kids full during the day and helps with learning. Kids love to dip! One other tip I have is offering fresh veggies with hummus or even a non-traditional salad dressing. My kids love Western dressing (it is a tangy French dressing). As parents, we get to decide what food comes into our house. We buy all the food and make those decisions on a weekly basis. We have to take ownership of the purchase process and select healthy items for snacks. Sometimes I fall into a pattern of doing what’s easiest instead of what’s really best and that’s been true when I buy quick packaged snacks. Read labels. I thought I was buying great packaged snacks until I started reading the labels. I couldn’t read the labels because there were so many odd ingredients. Packaged snacks are great and super helpful for busy schedules, just check the labels because there are healthier options with ingredients you can feel good about. Talk to your kids about healthy choice snacks and “sometimes” food snacks. 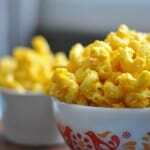 Teach them how to make good choices about snacks and have them help you make the choices at the grocery store. 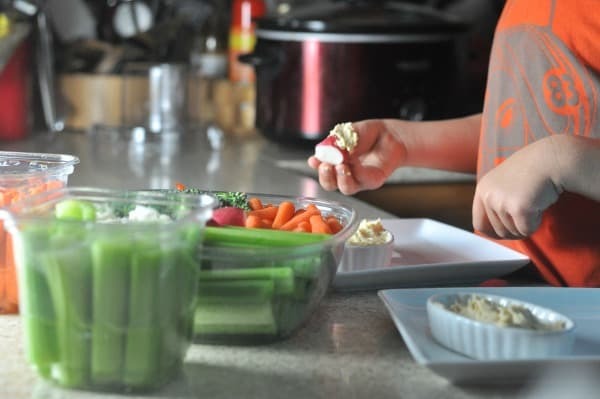 We forget to have these conversations with our kids, but teaching them about cooking and making good food choices is a life skill and it is our responsibility as their parents to help them with this skill. 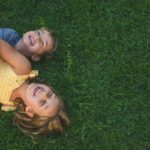 In the last few months we’ve been working on these tips to get your kids to eat healthy snacks and two unexpected things happened. 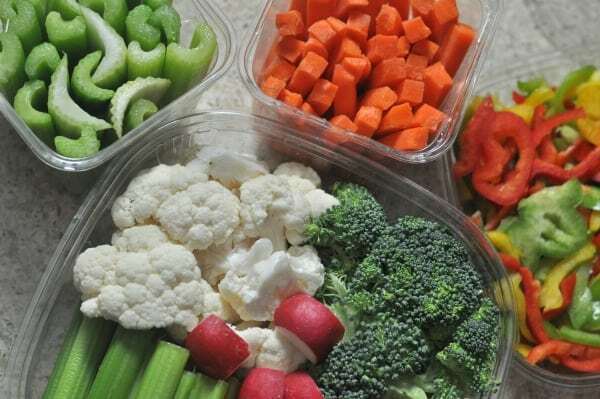 The first was that when my son had to bring in a packaged snack to school, I decided to send in the Crazy Fresh Veggie Value Bowl and some dips. According to my son, the kids really loved trying the veggies. The other unexpected thing that has happened is that I’m eating healthier snacks. I’ve been packing Crazy Fresh Carrot Sticks and their Tri-Color Peppers in my lunch each day. Now all of that is a win in my book! 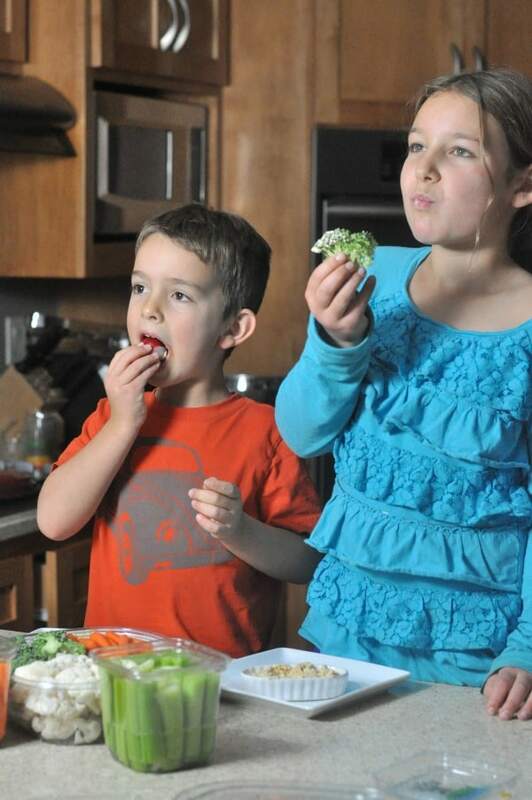 Do you have any tips to get your kids to eat healthy snacks? Share your favorite tips and foods in the comments, I’d love to hear from you. 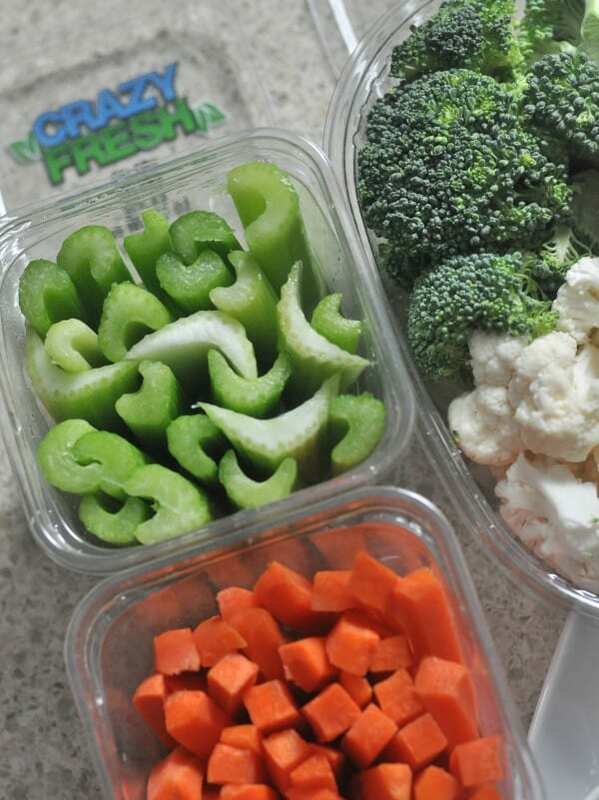 You can join Crazy Fresh Produce’s Crazy Fresh Kids program, it’s a way for kids to learn all about healthy eating and produce through fun games, recipes, and shopping challenges. They have some really fun prizes for participating including free birthday gifts! 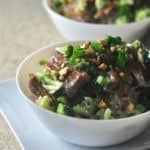 Connect with Crazy Fresh Produce on Facebook and Pinterest. This post is in partnership with Crazy Fresh Produce. All opinions are my own. Thank you to Crazy Fresh Produce for the opportunity to partner on this project and try their delicious food products. This entry was posted in inspiration and tagged family, kid friendly, snacks, vegetables by Alice Seuffert. Bookmark the permalink.